Siding Contractors Kansas City: Siding Is a Great Investment! If you’re like most homeowners in Blue Springs, then you’re probably looking for ways to increase your home’s curb appeal and overall resale value. While most homeowners opt to remodel the interior of their homes, exterior home renovation projects tend to provide higher returns on your investment (ROI). In today’s post, we’ll explain why you should make a siding replacement your next home renovation project. Blue Springs Siding and Windows proudly serves areas in Missouri and Kansas with window replacements, siding installations, and more! We would love to help you with your next siding replacement — to learn more about our home siding options, please come by our showroom at 2201 NW Jefferson Street in Blue Springs, or call a member of our staff at 816-629-6270 . Continue reading below to learn more about Home Siding! You’ve heard the phrase a million times in popular home and garden shows on TV, but it’s true — the importance of curb appeal cannot be overstated. First impressions are hard to change, and your home’s siding is one of the first things that your neighbors and potential buyers will see when they look at your home. Even if your home has a beautiful interior, shoddy siding can give your home a dilapidated and unkempt appearance, making buyers wonder what else may be wrong with your home. Plus, the majority of home searches are now done online, making it even more important to have stunning photos for your listing. According to a recent article in Consumer Affairs, exterior home improvements are the most effective way to increase your home’s value, while also recovering the vast majority of your investment. Take entry door installations as an example. While a new entry door certainly isn’t the biggest home improvement project you can take on, you can expect to recover up to 75 percent of your investment! With a potential return on investment of up to 89 percent, siding replacements are even more impressive. Vinyl siding is the most popular form of siding in the United States, and it’s easy to understand why. The main reason that homeowners choose vinyl siding is that it’s incredibly durable and will retain its integrity throughout even the toughest of storms. Moreover, vinyl siding requires very little maintenance, and the color you choose will remain vibrant and eye-catching for years to come. We have a number of siding colors from which to choose — view them on this page or come to our showroom to see them for yourself! 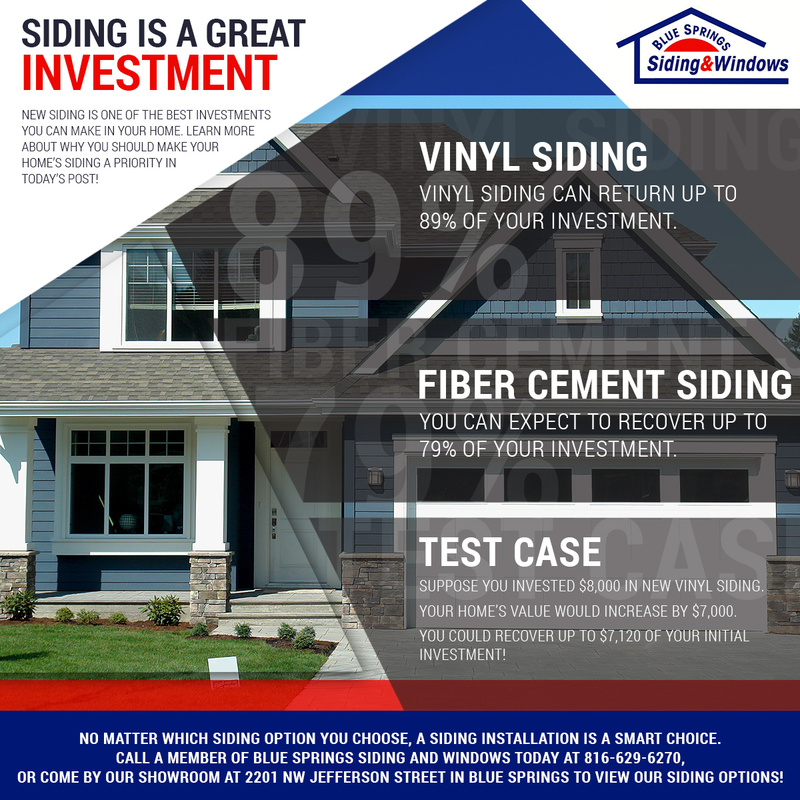 Suppose that you spent $8,000 on new vinyl siding for your home. With a ROI of just 75 percent, you would still recover $6,000! If you recovered the full 89 percent of your initial investment, then you would have $7,120 back in your pocket whenever you decided to sell your home. Fiber-cement siding has an equally impressive ROI rate of 79 percent, making either home siding option an excellent investment. Even if you’re not planning on selling your home for a few years, you should still focus on improving your home’s appearance from the outside in. As we noted in a previous post, new home siding can greatly improve your home’s energy efficiency. Warm and cool air may be escaping through cracks in your existing siding, leading to more expensive utility bills. With the hottest days of summer just around the corner, you want to ensure that your home is retaining as much conditioned air as possible! 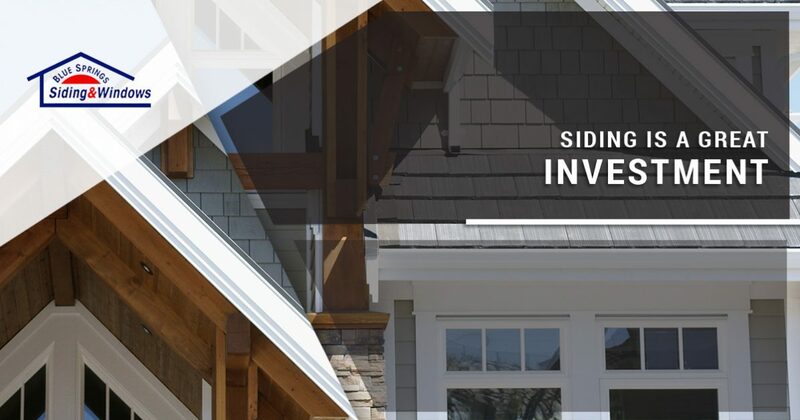 We hope that this post will inspire you to invest in new siding for your home. If you would like to learn more about our home siding options, or if you’re ready to get started with a siding installation, then just get in touch with a member of our staff! We’ll happily help you find siding that fits your needs without exceeding your budget. At Blue Springs Siding and Windows, we know that some home improvement project can’t be paid for in cash. We proudly offer flexible financing options that can help you purchase the siding you need, exactly when you need it. Call a member of our staff today at 816-629-6270 , or use the online contact form at the bottom of this page to request more information. We look forward to speaking with you soon!